When it come to analogue system of organizing your thoughts, tasks and goals, (which I myself 100% rely on) one definitely need a visual appealing journal, notebook or planner to put on work. In this post I've collected handful of my favorites, that are simple, beautifully designed and easy to navigate on and off your plans or thoughts of the day. If you're a fan of the format that is either plain pages or lined/structured minimally inside without cluttering the layout, dig yourself into this list now. You are gonna find one or two favorite for yourself! Note: This post contain affiliate links. Which means, if you use the link to make a purchase, I may receive a small commission. So if you do, Thank You! Please read site's disclaimer for more information. 1. Feria Notebook | Floral design over black and white stripes background, this softbound 128 lined pages notebook is designed by Christian Lacroix. 2. Undated Gold Lines Planner | This planner helps you schedule out your day, plan your week and make your monthly goals. It is the mixture of daily, weekly as well as monthly planner and has 60 tear-away sheets. Designed by Poketo. 3. Metal Bow Journal | Black journal with a pretty metal (gold) bow on the cover. It has 100 lined pages to write down your thoughts, ideas, lists to pretty much anything. It basically is A5 size hardcover journal. 4. Paris Memoir Notebook | Illustrated floral cover notebook is named Jardin De Paris. (meaning Paris Garden) Consist 130 ruled (neon pink) pages, design by Rifle Paper Co.
5. 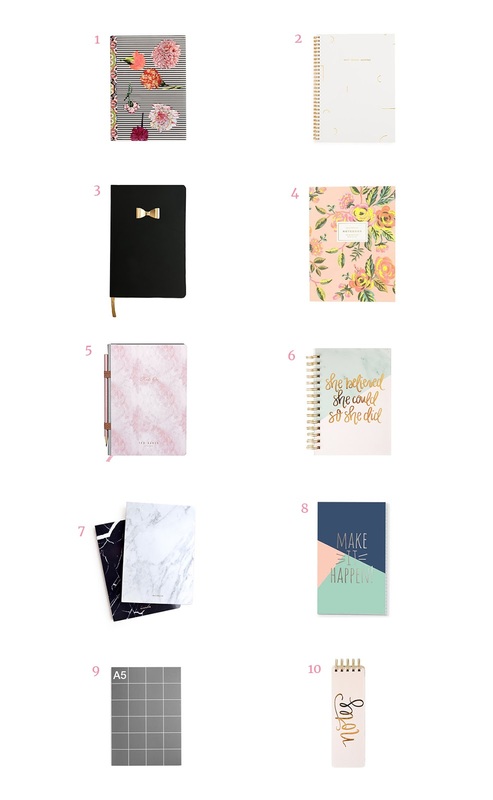 Rose Quartz Notebook | Who can't resist pretty rose gold, eh? This is an A5 notebook set with 128 pages and a pencil. Design by the very famous UK brand Ted Baker. 6. Gold Foil Quote Notebook | Quoted on the cover says "She Believed She Could So She Did" in gold foil over green marble and pale pink background. This hardcover notebook has 100 ruled pages for you to fill in all your goals and inspiration. 7. Marble Journal | Available in black and white. Marble print over journal cover and whooping 160 plan pages inside. This is also designed by Poketo. 8. Doc-It Journal | This is called Simple Stories Carpe Diem Posh Doc-It Journal. Its a simple A5 size journal with 24 double sided papers. Doc-it are available in many design with pretty prints and quotes. Check through Simple Stories. 9. A5 Monthly Planner | Simple, undated and monthly calendar structure planner. Flexible for you to put dates on and start planning your month. Again this is a product of Poketo, my personal favorite. 10. Notes Spiral Notebook | Hardcover gold foil notebook is specially for the professional list makers out there. You get 100 lined pages in total to jot down your important to-do list. It is a product of Sweet Water Decor. 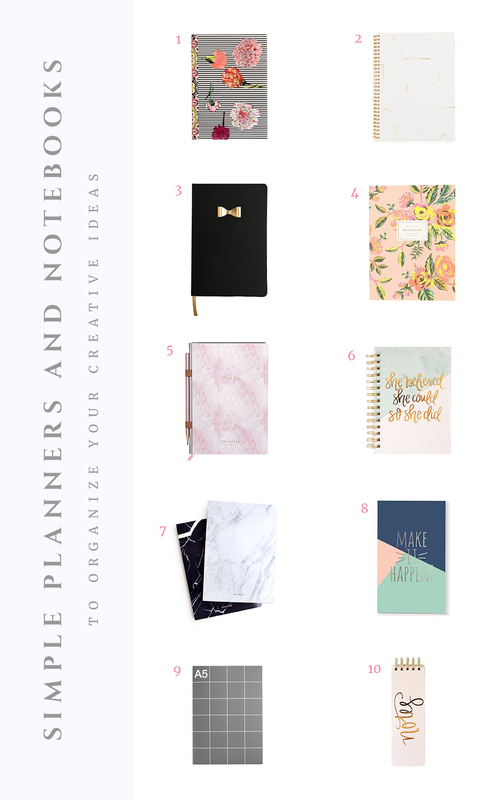 What are your go-to planner at the moment and how are you putting it to use? Share with me in the comments below. Would love to see your favorites!